Tap with your finger on a question to see the corresponding answer. Click on orange link inside the question to display the answer. Please hover with your mouse on a question from its left side to see the corresponding answer. Click on the orange link inside the answer to open it. 1) I applied for an account some days ago - why didn't I get any reaction from Semweb LLC yet ? Semweb is waiting for your reaction :) to give you access to SKOS Shuttle. SKOS Shuttle sent you upon successful application an email verification message at the address you specified. Although the application form tells upon successful registration that a message has been sent, your might have not read that indication and/or SKOS Shuttle email message landed in your SPAM filter. In this case, please look into your SPAM filter or ask your firewall expert to allow (deblock) email messages from semweb.ch, retrieve and react to that message, since Semweb must verify your email address (was it "you" requesting an account?) and how you wish to be contacted via a secure channel of your choice. If you do not find that message anymore, please be proactive and contact Semweb LLC via email or phone. You might also repeat the registration process after having taken a look at the account registration process from desktop or mobile. 2) Why can't I get SKOS Shuttle access credentials via normal e-Mail? That's why it is so important to quickly answer/react to Semweb's confirmation e-mail message after your application. 3) Do you have some examples for using the API? The best thing you can do is creating an API user separated from your user and assigning it to your project. 4) What are the prices of SKOS Shuttle ? SKOS Shuttle as a service has no prices. It has monthly tariffs upon the real need you have. Please cf. the fees here. 5) SKOS Shuttle service on https://ch.semweb.ch:10000/S2M/SkosShuttle/ doesn't work, the browser says "cannot reach this page"; is there another way to access that service? SKOS Shuttle is directly served via port 10000. If that port is blocked, SKOS Shuttle will not come with its login page. If you are calling SKOS Shuttle service from a company or an university, possibly that port 10000 is blocked for security reasons. Port 10000 does not introduce any insecurity: some organisations close all ports but the standard ones merely as a (restricted) security policy. In order to quickly overcome this, Semweb has provided a PROXY service on the URL https://ch.semweb.ch/S2M/SkosShuttle/ reproducing exactly the direct service on port 10000, this will result in a bit slower performance but go through the standard port (443). 6) How long can I use SKOS Shuttle ? SKOS Shuttle can be used as long as you purchase a valid tariff or as along as Semweb LLC will finance this service. Semweb LLC reserves itself to stop the service with a two months notice. 7) What happens if I do not need to use SKOS Shuttle anymore ? SKOS Shuttle should support you in all phases of your project(s). If you have purchased a tariff and did not comsume it until its end, your account will be kept until you start again using it. Users with a free tariff will have to use SKOS Shuttle at least once a month. A special "cleaner" will detect unused free accounts, notify its root user and one further month it will securely archive the account. This preserves resources at Semweb LLC and give other users a leaner system. You are welcome to apply again for a new free account at any time. Ask Semweb for some special arrangements. SKOS Shuttle is an RDF middleware to comfortably edit SKOS data. It is intended for RDF low and middle experienced taxonomists but also for RDF experts as an easy maintainable layer for your RDF data. Despite this dichotomy it is Semweb conviction that it still offers a good compromise in order to save time and work for both categories. If you feel that SKOS Shuttle be not "intuitive", as until now luckly only one expert told us (without saying what should be improved), please have a look at the provided tutorials or videos or contact Semweb in a constructive way. Semweb will enqueue every request/proposal and under some circumstances also your issue will be realized. When a tutorial is publiced, it is obviously up-to-date. Since Semweb puts more importance on operating and developing, it can occur that some few tutorials do not reflect the current state of the art. Please be glad, that SKOS Shuttle has been updated. Documentation is an important step and it will be pursued as soon as no (more) important tasks exist. In most cases the tutorial is still valid for the main content it reflects and purpose it might fulfill. Please contact Semweb for any case where you preceive some big discrepancy between SKOS Shuttle behaviour and the publiced tutorials. SKOS Shuttle uses for its internal Blazegraph RDF store its standard Sesame's RIO classes and for any REST access to your RDF repository, the upload interface method relative to the vendor of the used RDF store. Possible general import (upload) errors might arise because of special characters included in the sent stream. Please be patient and communicate this to Semweb, which will be glad to help you. Pls. see the RDF importing tutorial for some further advice. 11) Why I do not see my RDF thesaurus in SKOS Shuttle after successful RDF import? 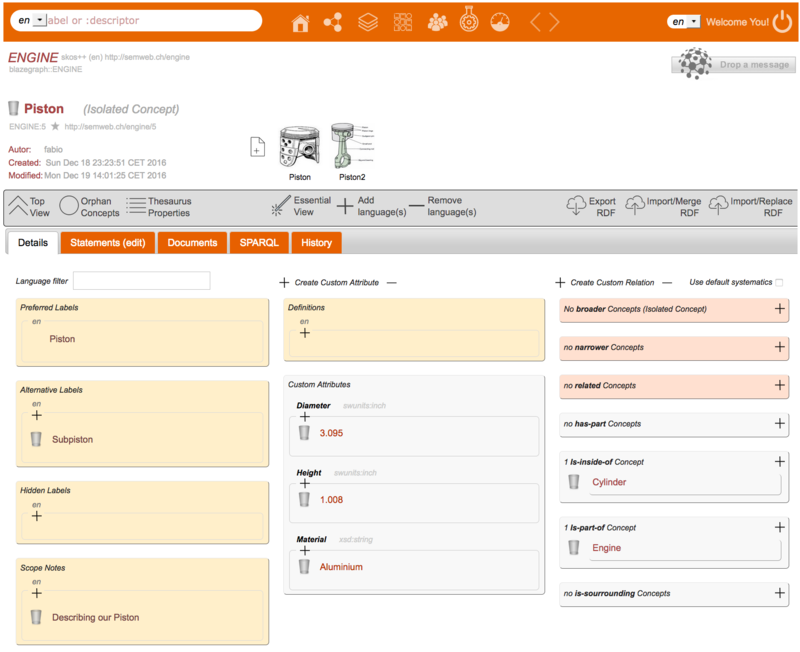 Although SKOS Shuttle is able to directly visualize an imported SKOS thesaurus - eg. STW, you might not be seing your thesaurus directly after a succesfull import. Not seeing a Thesaurus does not mean, your thesaurus is not loaded (You can try typing some label text in the autocomplete search field of SKOS Shuttle.) In order to visualize a thesaurus "starting point", SKOS Shuttle needs a Concept Scheme and below that some top Concepts. If it finds none, it creates one for You to customize. Using the deorphanization assistant SKOS Shuttle visualize concepts without broader links and gives you the possibility to link them as needed without touching a single line of SPARQL. We care about Your project! Ask Semweb for support for an ideal import or for a suitable modification of your RDF data. See the RDF importing tutorial for some advice. 12) Why I cannot see my RDF thesaurus in SKOS Shuttle after pressing "Export RDF" or "Download Snapshot"? Not seeing a Thesaurus or a partial RDF export does not necessarily mean, your thesaurus was not (partially) exported. Please look in your browser whether the browser had blocked pop-ups coming from semweb and tell the browser to allow all kind of pop-ups from semweb. If you do not see anything "strange" (any indication) on your browser please search in google for "allowing pop-ups in my browser". As soon as you have allowed pop-ups for semweb in your browser, the content of blocked pop-ups should be automatically shown. If it is not the case, please re-press on the Export/Download button and you will see the pop-up(s) content in your browser. 13) Is "RDF import" the same as "Snapshot import" ? Not really. Snapshot Import is a clean RDF repository import. It just consider the uploading RDF file as a SKOS Shuttle content. So ideally, you should use this function only for previously exported "Snapshot Exports". On the other way, "RDF import" allows you to introduce RDF data into your thesaurus in your RDF repository; the content of this import can be taken from any RDF source. It is important that you know what you are importing in order to use the imported data. For this purpose see the RDF importing tutorial for some advice. 14) I imported OWL files from protégé into SKOS Shuttle. Why I do not see my content ? If the import was successful (no warnings), your RDF data have been imported and you can see them via SPARQL query inside the same project where you imported. Protégé generates OWL content (OWL classes), which is only partially recognized by SKOS Shuttle. In order to see some content in SKOS Shuttle detail view, an entity must be of type skos:Concept or skos:conceptScheme and have at least a skos:prefLabel in the standard language setting of your project. Please see SKOS primer Furthermore SKOS Shuttle shows per default skos:broader / skos:narrower / skos:related links. Please provide your RDF data with such links in order to be visualized in SKOS Shuttle. SKOS Shuttle can load OWL ontologies via the appropriate ontology panel into schemes and use their data properties to enrich SKOS entities as described in this tutorial. Please do not hesitate to call Semweb for any questions. 15) What is the supporting approach of Semweb on SKOS Shuttle ? We care about Your project(s)! But Semweb also cares about your experience on SKOS Shuttle. Offering a service via Web is not an anonymous action for Semweb. We care that you are performing well with it, we see a smart and proactive personal communication as the basis for a win-win situation. Bring your time and care, Semweb will do the same with you. That is the reason why Semweb prefers to get personally in contact with you, once you apply for a SKOS Shuttle account. Please contact Semweb for any questions. 16) Can Semweb help me in my RDF project(s) ? We care about Your project(s)! Semweb is glad to support you upon mandate before or during the realization of your RDF project(s), also integrating / modifying SKOS Shuttle to your particular needs. It can advise you on some special issue or execute Your mandate for a "turn-key" realization of Your system, up to hire and coordinate a team within that mandate. Contact Semweb for any questions. 17) Why does SKOS shuttle look so **poorly** on my computer ? With which resolution are you normally working with SKOS Shuttle? SKOS Shuttle is optimized to work with a resolution starting ideally at least from 1300 x 700 pixels. It has opportune media switches which adapt menu bar and main components to some useful content, when its window is narrowed. Having enough resolution will offer you a more relaxing view, like e.g. this one. SKOS Shuttle is a desktop application. Viewing SKOS Shuttle from a tablet or a mobile device might result in a suboptimal rendering. 18) Why does SKOS shuttle Graphical User Interface looks so simple ? Semweb is sorry for this. SKOS Shuttle is a service completely financed by Semweb LLC. The focus has been put on functionality, however the maximum has been done to shape its elements in a way that non experienced users as well as experienced users can orientate themselves easily. A big font and simple structures have been choosed right to facilitate access and information processing. If you are ***not*** of this opinion, have some ***constructive*** suggestions, welcome to enhance SKOS Shuttle to some more actractive standards! 19) I can't get a project done, I am overwhelmed ... what shell I do ? Semweb needs your interaction Sorry you are overwhelmed. In most cases Semweb can help you to fix your problem in short time. Please take a look at the tutorials and / or videos Semweb patiently and free of costs made available to you. If you stop interacting just here, nothing (more) will occur. Please take a rest and consider starting a dialog with Semweb. Thank you for displaying this answer! Please click in this page viewed from a desktop device on the "Online consultant" or "Drop a message" button top right and formulate your question there. Semweb will be happy to answer it. Should your question be of general interest, it will be published here.